Coaching and developing employees is the hardest thing a manager must do. It requires trust, patience, and it takes time, time managers may not feel they have. The old adage, “If you want something done right, do it yourself” may at times feel true, but it also leaves managers overextended, unfocused and with an underdeveloped staff. Giving direct reports an appropriate amount of responsibility and accountability is the only way employees develop and the only way managers get out of the weeds and are able to focus on the work they’re supposed to be doing, leading people and departments. Also, a lack of growth and development opportunities is the greatest impetus for employee turnover. If you want your staff to stay and be engaged, they need to feel that they are developing new skills and abilities. Use our business coaching training to learn how to coach and delegate appropriately so both managers and direct reports get what they need. Managers get results and more time to focus on their own accountabilities and employees learn new skills and become more autonomous. Create a more satisfied and engaged long term work force. Develop employees for long term growth and mobility. Have more time to focus on one’s own responsibilities. Create environments of accountability and unprecedented results. Coach and provide feedback in a way that reduces defensiveness and increases receptivity. Give staff just enough room to grow and develop, but not enough to fail. 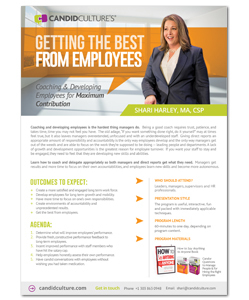 Assess performance and adjust your management style to develop staff and manage for results. Manage performance issues in a way that inspires and motivates employees. One half day to two full days, depending on content.